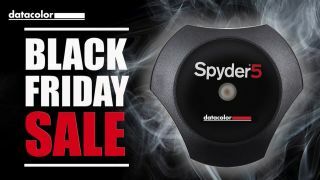 Datacolor has announced major Black Friday price cuts on two of its most popular monitor calibrators. Choose from the midrange Spyder5PRO montor calibrator, discounted to €99 /£88 - that's a price cut of €80/£70, making the PRO even cheaper than the entry-level Spyder5EXPRESS. There's an even bigger discount to be had on the top-line Spyder5ELITE calibrator, which can now be had for just €129/£114 - a saving of €130/£116. That's around 50% off! These deal prices are only guaranteed by shopping direct from Datacolor at www.datacolor.com, and you'll need to pay in Euros. The Spyder5 Pro is an ideal monitor calibrator for photographers. The compact device will colour calibrate your laptop or desktop display to an industry color reference standard and determine optimal screen brightness, exposing the fine shadow details and highlights in your photos. With the Display Analysis feature, you can measure not only colour, but also brightness, contrast, gamut, tone response and white point to assess the performance of your display and compare it to other monitors in your home. Step up to the Spyder5 Elite and get all the Pro's features, plus expert tech like Advanced Multiple Display Matching to fine-tune multiple monitors and projectors, matching brightness, white point, and gamma. It's ideal for multi-monitor set-ups or a small studio where displays need to display identical colour. Delve deeper to find more pro-spec features like fine-tune grey calibration, unlimited gamma choices, white point, and luminance, giving you the best possible control over the monitor calibraiton process via the Expert Console. Alternatively, if you just want to calibrate and get straight to editing, the Elite's software still has a simple wizard-driven interface to give you perfect colour in a few easy steps. The Spyder5 Elite builds on the Pro's Display Analysis features, including a powerful module that lets you fully characterise your display and track its performance over time with reporting. Compare gamuts between displays and standard color spaces, analyze and graph luminance and color uniformity, map tone response curves, and measure and graph display accuracy against SpyderCHECKR color targets. In fact, the Spyder5 Elite's Display Analysis features are so comprehensive, we choose it as our preferred calibration device for our in-house display testing.